4Videosoft iPhone Transfer is professional software to transfer your files like music, movies, photos and more between iPhone and computer without limitation. You are able to convert DVD movies and general videos to iPhone MP4/MOV/M4V without any loss. And this software enables you to make ringtone for your iPhone. Now, it highly supports the latest iOS devices like iPhone 5S, iPhone 5C, iPhone 5, iPad Air, iPad mini 2, iPod touch, etc. 4Videosoft iPhone Transfer is able to help you transfer your local files to iPhone and back up the iPhone files to computer with no limitation. You are allowed to save storage for your iPhone by exporting your files to the computer. 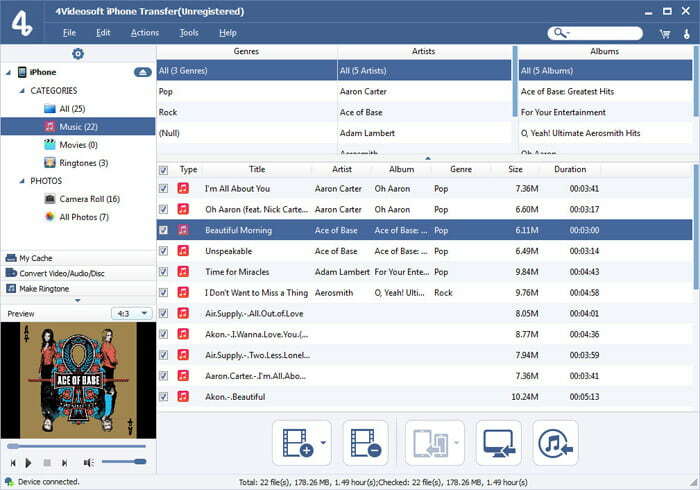 In addition, you can transfer files between PC and iPad/iPod as well as two different devices. The professional iPhone Transfer has powerful iPhone Video Converter function. It works well in converting iPhone videos. You are able to convert DVD movies and other popular videos to iPhone MP4, MOV and M4V. These converted videos are able to play on your iPhone 5S/5C, iPhone 5, iPad Air, iPad 4, iPod touch and more. 4Videosoft iPhone Transfer is able to make ringtone for your iPhone with the local songs. You can also make personal ringtone with colorful DVD movies and ordinary videos. The iPhone Transfer enables you to preview the source video and pre-listen the music. You will know the devices information immediately once connecting the device to the program.